There's a lot of talk out there about the changes that the city of San Francisco is going through during the current tech boom. A lot of it is blather, as satirized in Joe Garofoli and Peter Hartlaub's What Out Of Town Writers Need To Know About SF. Step 6: Get your adjectives straight. There are decisions to be made. What double-barreled description will you give the Mission? “Gritty and trendy”? “Seedy and hip”? “Vibrant and overpriced”? Is it populated by “Latinos and the technorati”? How Burrowing Owls Lead To Vomiting Anarchists (Or SF’s Housing Crisis Explained) by Kim-Mai Cutler is smart about policy and history. San Francisco’s orientation towards growth control has 50 years of history behind it and more than 80 percent of the city’s housing stock is either owner-occupied or rent controlled. The city’s height limits, its rent control and its formidable permitting process are all products of tenant, environmental and preservationist movements that have arisen and fallen over decades. 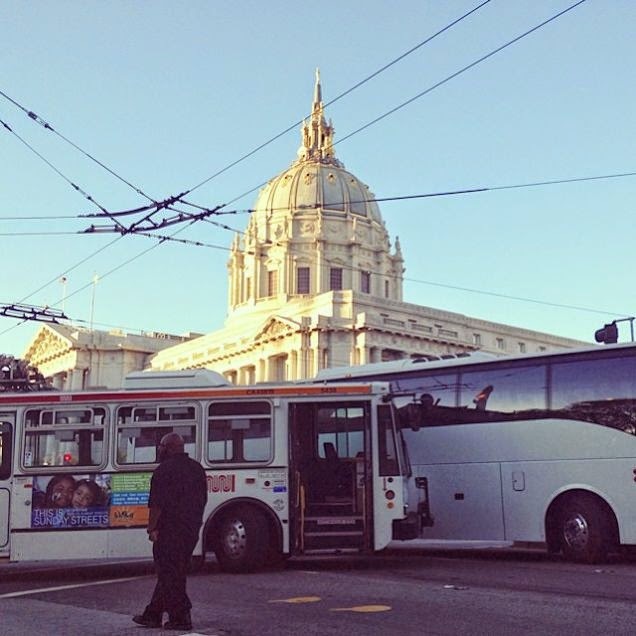 A tale of two cities: how San Francisco's tech boom is widening the gap between rich and poor by Laurie Penny does a good job of getting the flavor of the current state of the City right. There are two things every child knows about bubbles: they are beautiful, and they burst. Time and again, I am told that San Francisco is “a bubble” — referring both to the gorgeous, insular never-neverland where workers in the city’s tech and associated industries live and play and to the localised economic boom that has fuelled the fat years. Living in a Fool's Paradise by Mark Hogan provides a look at the complex history and policy failures throughout the Bay Area which have produced the current situation. Caution is warranted when considering construction projects in such a beautiful place. But the current state of permitting regulations for building and the glacial pace of infrastructure projects in San Francisco benefit very few people and risk turning it into a caricature of its former self for tourists and residents rich enough to live in a fantasy, not a living city. If there was ever a time when San Francisco needed to embrace a dynamic, expansive policy for building housing, offices and transportation, it is now. Longtime San Francisco residents who fought for so long worry that the city they love is disappearing. They’re too late. That city is gone and they, in some ways, have aided its demise. Cities are like living organisms, not flies trapped in amber. Protestors long fought the “Manhattanization” of San Francisco—not wanting to see their mostly low-rise city dominated by high rises and dark urban canyons. Instead they’re getting the other kind of Manhattanization—a playground for the rich with little room for the artists and regular folk who held down the fort for so long. Why housing costs keep rising in San Francisco from transit planner Michael Rhodes describes a few economic fundamentals that should be obvious. The number of employed residents in San Francisco has grown at almost twice the rate as the number of additional homes since 1990, exacerbating our housing shortage. As a result, the cost of renting in San Francisco has doubled since 1995, when a two-bedroom apartment cost $1,700 a month. In the 54 years since 1960, San Francisco has added about as many housing units as we used to add every 15 years, even as the city and region have seen steady job growth. Our current housing building boom is the result of a long backlog during the recession, and won’t be enough to catch up to demand unless it is sustained for a long period of time. Housing costs will only continue to rise unless we support adding new homes in San Francisco and other transit-oriented areas of the Bay Area. By building near transit, we can accommodate this growth while preserving and enhancing our region’s quality of life. What's the Matter With San Francisco? from Gabriel Metcalfe at Citylab describes a little history of the politics of San Francisco housing policy. It’s our own version of What’s the Matter With Kansas? —the 2005 book in which Thomas Frank tries to explain how working-class Americans came to vote for right wing politicians against their own economic self-interest. In San Francisco’s case, many tenants came to vote against new development in an attempt to show their disdain for monied interests. The problem is that this stance happens to result in very expensive rents in the long run. As the city got more and more expensive, progressive housing policy shifted gradually to a sad, rearguard movement to protect the people already here from being displaced. No longer would San Francisco even try to remain open as a refuge for immigrants and radicals from around the world. The San Francisco Left could never come to terms with its central contradiction of being against the creation of more “places” that would give new people the chance to live in the city. Once San Francisco was no longer open to freaks and dissidents, immigrants and refugees, because it was deemed to be “full,” it could no longer fulfill its progressive values, could no longer do anything for the people who weren’t already here. Airbnb, Proposition F And The Shared Hypocrisy Of Bay Area Housing from Kim-Mai Cutler at TechCrunch is a discussion of a particular San Francisco ballot measure which provides a lot of great background on the weird politics of housing in San Francisco and the Bay Area at large. Why Are People Blocking Housing Development? It varies by jurisdiction. In most of the 101 cities around the Bay Area, tenants are just outnumbered by homeowners, who don’t have a strong reason to add more homes because they’ve already got theirs. In many Californian cities like Palo Alto, there’s almost nothing you can do because you may never mathematically have the votes. But in San Francisco, it’s different. This is a majority tenant city. Tech founders, are, of course, frustrated. They’d like to hire thousands of engineers over the next several years, but the competition for housing is driving up rents and salary costs higher and higher. And again, the city can’t coerce land owners into selling their property to non-profit developers. So unless the moratorium is permanent, land owners might sit it out until the end because they don’t want to sell at a discount. Blame Zoning, Not Tech, for San Francisco's Housing Crisis from Kriston Capps at Citylab makes some smart observations about NIMBYism and gentrification. As Rick Jacobus explains for Shelterforce, building new housing units anywhere—whether they’re set-aside affordable units or penthouse condos—goes in the win column from a regional perspective. But when new units mean penthouse condos in a low-end neighborhood, the region may prosper at the potential expense of the neighborhood. What happened in South of Market and parts of Brooklyn and what people fear in the Mission (and the rest of Brooklyn!) is that high-rise luxury housing was dropped into otherwise distressed neighborhoods. These luxury projects dramatically changed the perception of these neighborhoods—they sent a clear signal to the market that these places were safe—both in the sense that they were safe for wealthier residents to live in and in the sense that they were safe for more investment in residential development. However much these projects decreased rents regionally by increasing supply, they had a larger impact of increasing rents in the immediately surrounding neighborhoods by increasing demand. The new wealthy are ruining everything because the old wealthy decided not to let them live anywhere near them. Big Tech Isn’t the Problem With Homelessness. It’s All of Us is a very good overview of the policy failures which produce the bizarre situation in the Bay Area. The city is turning into a Brechtian horror show where young men wearing Airpods and backpacks emblazoned with the names of gig-economy apps weave e-scooters among people passed out in their own filth. Carpetbaggers is a comment on the effect the two tech booms I have seen have had on San Francisco. 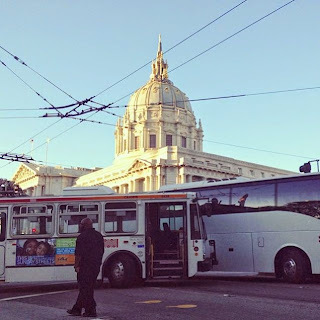 Forgive me linking a post of my own: as a pre-Boom San Franciscan and a tech professional, I literally embody the split. Don't Say This To A NIMBY is a little example of the weird psychology of longtime residents who want to personalize the causes of change. This actually happened and is paraphrased to the best of my memory. Me: Thanks for creating this Facebook group about Palo Alto’s history. Since I’ve only lived here a couple of years, I feel I have a lot to catch up on. How long have you lived here? Admin: I’ve lived here since the Seventies and it’s crazy now. Did you see this rental ad for a van? Someone actually lives in a van! What if they need a bathroom? Me: I dunno, bedpan and use the shower at the gym? You’re right that it’s crazy. I blame voters who block development. If it wasn’t for that housing shortage, people could live in proper apartments instead of spilling out into vans, illegally-converted garages, and cardboard boxes. Admin: It’s those tech workers, is what it is. They raise rents and make mortgages unaffordable for anyone but themselves. Thank goodness we bought our house back when this area was quiet. Me: Did you grow up here? Admin: No, we moved here when my husband was hired by IBM. Me: Oh, so he’s a tech worker like my husband. The only difference is you came here forty years earlier so you lucked into an affordable market while we pay top dollar for a clapboard apartment. You’re just like us! SF needs a new, huge, high end, urban village a la the Miracle Mile in Chicago. Rezone a few blocks on both sides of Caesar Chavez and let the developers buy out the renters with million dollar golden handshakes (cheap at twice the price) and build a McMidtown with dedicated underground lanes for Google-buses, transit, with bike lanes stroller lanes, piazas on the surface. Ban cars in the whole area. Garages at the far end of many of the side streets.